Al-Qaeda offshoots are set to declare an Islamist state in Syria’s north on Eid al-Fitr (August 8), according to Saudi Arabia’s leading daily Asharq Alawsat quoting a Free Syrian Army (FSA) top dog. The paper quotes him saying the al-Qaeda-linked groups hope by then to have wrested control from the FSA of the two border crossings into Turkey: Bab al-Hawa and Harem. Bab al-Hawa links Turkish and Syrian highways between the cities of Iskenderun and Aleppo. The closest town to Bab al-Hawa on the Turkish side of the border is Reyhanli in Hatay province, and the nearest town on the Syrian side is al-Dana. Harem is right by the Turkish frontier in Syria’s northern Idlib Province. The FSA official speaking to Asharq Alawsat linked plans to declare an Islamic state in Syria’s north to recent killings by the Islamic State of Iraq and the Levant of two senior FSA officers – namely, Fadi al-Qish, a local FSA commander in the village of al-Dana and Kamal Hamami (aka Abu Baseer al-Ladkani), member of the FSA Supreme Military Council. Asharq Alawsat’s FSA source said the FSA was deploying units and checkpoints in areas targeted by the Islamic State of Iraq and the Levant to prevent them falling into its fighters’ hands. Irrespective of the accuracy of reports about armed clashes between al-Qaeda and the FSA, and the attempt to assassinate the latter’s overall commander Gen. Salim Idriss, this is what is in the cards, whether now or later on. The confrontation between al-Qaeda and the Syrians is inevitable because al-Qaeda is the fleeting anomaly while Syrian moderation is the established rule. The irony is that the FSA is still being deprived of qualitative arms and left to face this array of forces singlehanded. Gen. Idriss has accused David Cameron of betrayal after the British Prime Minister abandoned plans to arm the Syrian opposition. He said the decision would "leave us alone to be killed" by Assad, and pave the way for al-Qaeda to dominate rebel ranks. Gen. Idriss hit out in an interview with The Daily Telegraph after Downing Street confirmed Cameron had ruled out arming the opposition on advise from the British military. The government had previously hinted that it was strongly considering it, successfully lobbying two months ago for an end to the European Union arms embargo. But military chiefs at Britain's National Security Council are understood to have warned Downing Street the conflict was now too advanced for basic weapons supplies to make much difference. They said that could only be achieved by a much-larger scale intervention, involving jet strikes on regime air defenses and bases, which Britain has already ruled out. Instead, Britain will draw up plans to train moderate rebel units and continue supplying "non-lethal" items like body armor and communications equipment. Idriss greeted the British change of heart with fury. The FSA has spent much of the last two years trying to persuade the West to give it military backing. "The West promises and promises. This is a joke now," Idriss said, the anger clear in his voice. "I have not had the opportunity to ask David Cameron personally if he will leave us alone to be killed. On behalf of all the Syrians, thank you very much." "What are our friends in the West waiting for?" asked Idriss. "For Iran and Hezbollah to kill all the Syrian people?" He also warned the West’s refusal to arm the more moderate elements of the insurgency would hand Syria's revolution to extremist groups, who already have better access to weapons. "Soon there will be no FSA to arm," he said. "The Islamic groups will take control of everything, and this is not in the interests of Britain." The British refusal will be seen as a particular blow to rebel morale given that recent signals suggested the government was planning the very opposite tack. Only last month, William Hague, the Foreign Secretary, insisted Britain "shouldn't rule any option out," claiming that concerns about arms earmarked for secular rebel groups falling into jihadist hands were exaggerated. “Greater Syria: From Dagestan to Xinjiang” is the title of a related and enlightening think piece by veteran Lebanese political analyst Jihad el-Zein for today’s edition of the Beirut daily an-Nahar. The Syria crisis is into a third “jihadist” phase, having already gone through “civil” then “militarized” chapters. The “jihadist” phase currently underway elicits greater commitment by Russia and China because it touches on their home front concerns. Earlier this month, for instance, Chinese state media blamed Syrians for unrest in Xinjiang, which is home to the minority Muslim Uighur population. This time Beijing laid the blame squarely on terrorists in Syria, of which the al-Qaeda-affiliated al-Nusra Front is the most notorious, but the charge of a Syria connection still comports with a common government narrative of portraying Xinjiang’s violence as coming from other countries, such as Pakistan and Afghanistan, rather than homegrown agitation. While about 90 per cent of China is ethnic Han, more than 40 per cent of Xinjiang’s 22 million people are Uighurs. The Global Times, a tabloid owned by the Communist Party mouthpiece, the People's Daily, said some members of the East Turkestan faction had moved from Turkey into Syria. The rise of Salafist militancy in Syrian rebel groups is a tremendous concern for Russia too. Moscow fears the numbers and efficacy of forces such as al-Nusra Front will one day turn their attention to oppressed Muslim regions in Russia such as Dagestan and Chechnya. Dagestan, the region where the brothers who bombed this year's Boston Marathon once lived, borders on the Caspian Sea, Azerbaijan, Chechnya and Georgia. President Vladimir Putin has dismissed the leader of Dagestan, where an Islamist insurgency is raging. The region has taken over from neighboring Chechnya as Russia's most volatile province. Salafist fighters, including some from al-Qaeda, fought in Chechnya in the 1990s; they may do so again. Syria and Chechnya are only five hundred miles apart. If you looked at a map of Russia, you would see Dagestan’s seaports on the Caspian Sea can easily ferry arms and everything else to neighboring Iran and from there across the “Shiite Crescent” to Syria via Iraq. 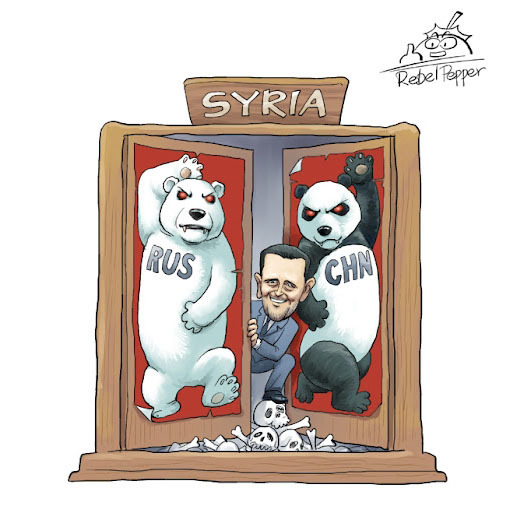 The struggle for Syria is thus strategic, not tactical, for Russia and less so China. Both have a bigger stake now in the “jihadist” chapter of the Syria crisis as it impacts their respective home fronts. -- Latitude from South Lebanon’s Naqoura to Tehran, taking in the Shiite spread.